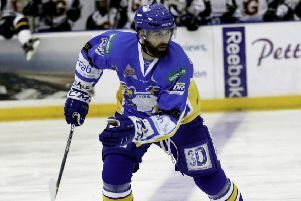 Do you remember ‘The Bird’ from hockey nights in Fife? Mascots come in all shapes and sizes, but many ice hockey fans will surely remember The Bird. Fife Flyers launched their feathered friend on match nights in the 1990s. Pictured at the photo-shoot are defenceman Ryan Kummu and Kirkcaldy forward, Iain Robertson. The Bird was followed by Moley, when the team was sponsored by United Artists, and then Sam The Bear which came courtesy of main backers, Sterling Furniture. Sam was eventually retired and replaced by current incarnation, Geordie Munro.